You've probably seen the video of an animated Yeng Guiao getting ejected after being hit with his second technical foul late in the third quarter of a recent game between the Rain or Shine Elasto Painters and the Alaska Aces. "Wala nang nanonood sa'tin, ref," the fiery coach is overheard while he made his way out of the playing court. He may have blurted it out of frustration, but Guiao's statement somewhat speaks of the current state of the PBA, especially with the ostensibly low turnout during the recent PBA All-Star Weekend. Not to worry though, as the local basketball gods seemed to have heard Yeng, bestowing us a couple of highly competitive, double-overtime games over the weekend. All it took was a long bomb from Globalport's Anthony Semerad—his sixth of the night—to douse Meralco import Allen Durham's hot hand (55 points) and a furious rally by the opposing team to put his squad up for good, 126-123. Aside from securing his team's first win in the Governors' Cup, Semerad also had a career-high 24 points to back up their own reinforcement's (Michael Glover) 26 markers and 16 rebounds. 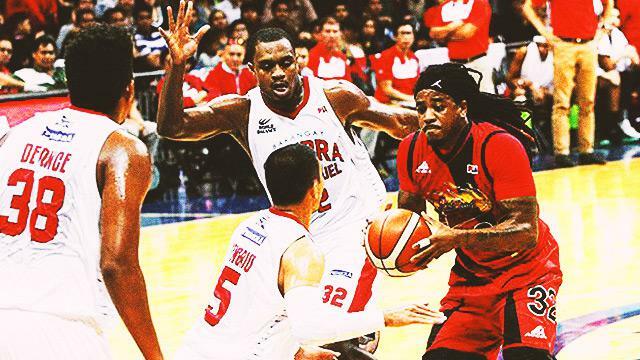 The Batang Pier was poised for victory in regulation, if not for the Bolts tying the count and Cliff Hodge making a defensive stop, sending the game into the first extra period. Another five minutes was needed after Stanley Pringle failed to convert a last-second reverse layup. The reigning champs got a taste of the Barangay's "Never Say Die" spirit, as the Beermen had to survive multiple comebacks, en route to a 111-105 double-OT win. San Miguel import AZ Reid took over in the second extra period, scoring six of his team-high 26 points. Reid didn't have to do the heavy lifting, though; MVP June Mar Fajardo and Marcio Lassiter put up 17 points each, while Alex Cabagnot and Ronald Tubid added 16 and 14, respectively. Ginebra's Japeth Aguilar was instrumental in extending the game, denying Fajardo in the final play of regulation, and tying the game with a three-pointer and coming up with an interception in the waning seconds of the first overtime. Watch the full game at Sports5's YouTube channel.